HomeBlogSpiritualityWhen Should You Change Churches? I knew part of the answer, but I needed to contemplate how far to take my response. Part of my hesitation stemmed from the reality that sometimes I changed churches for the wrong reasons. I’ve changed churches eight times in my life. Some of you might think that’s a lot and others might think that’s not much at all. Of the eight times, five were for the right reasons, while the other three fall into a gray area and may lack a sound motive. 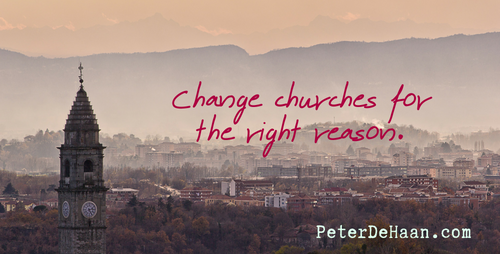 Here are the reasons for when you should change churches. When you move out of the area and it’s no longer practical or feasible to continue going to your old church, it’s time to find a new one. Don’t delay. Set about finding a new church right away. Each Sunday you take a week off from church makes it a little bit harder to return to that practice. And if you wait too long, you may never go back. Each week churches close. It’s a statistical fact. And if it’s your church that shuts down, then you’re faced with the task of finding a new one to plug into. Churches seldom shutter abruptly. There’s usually plenty of warning. They’ve been dying a slow death over months, years, and sometimes even decades. It’s sad anytime a church closes, and there may be a time of mourning over what you lost. In addition to not having a place to go each week, the friends you’re used to seeing typically scatter and end up at various churches. So, in addition to losing your church home, you’ve also lost your church family. When this happens it’s time to find a new spiritual community and make a new church home. Sometimes one church will start another one. It may be a satellite location or planting an independent church. You may be part of the launch team. Though this could be a short-term responsibility, it’s usually a long-term commitment. Another scenario occurs if God calls you (that is, the Holy Spirit prompts you) to move to a different area and help start a new church. Whether in name or in function, this is being a missionary. Leaving one church as a missionary is an obvious time when it’s appropriate to change churches. Jesus is central to Christianity, and he must be part of every church that bears his name. If you go to a church that has pushed Jesus aside or fails to acknowledge him and what he did for us, then question if it’s truly a Christian church. A church without Jesus is a church that doesn’t warrant your attention. If Jesus isn’t there, you probably shouldn’t be there either. It’s time to change churches. This one is harder to define, but sometimes we may find ourselves in a church that is so misaligned with who we are and where we are in our walk with Jesus, that it gnaws at our soul. Persevering in that environment pulls us away from God and threatens to derail our faith. I would never encourage anyone to persist in a church community that is damaging their relationship with God. If this happens, it’s time to find a new church community. Seek one will help you draw near to God and encourage you in your faith. Are There Other Times to Change Churches? What about other beliefs? Christianity is filled with various viewpoints on faith and theology. If Jesus remains the core, I encourage us to accept one another for our other differences in belief and practice. Yes, some people view these differences as heretical, but I don’t think Jesus does. Based on what he prayed in the Bible (John 17:20-26), I know that he wants us to get along, to remain united, and to act as one. Leaving one church because we disagree with an element or two of their religious platform is a bad reason to leave. This implies there may be a sixth reason to change churches, but it’s one that’s hard to define. Its subjective. And any time something is subjective it means that our emotions can replace logic, which allows us the latitude to make about any determination we want. And usually that decision leads us to change churches even though we probably shouldn’t. But regardless of the reasons of why you want to change churches, before you do, take a careful look at when not to change churches. Pray about it, and ask for Holy Spirit guidance. If he says it’s time to move on, then move. And to help you on this new adventure, check out “How to Find a New Church.” May God bless you in your search for a new church home and guide you to the place he wants you to be.